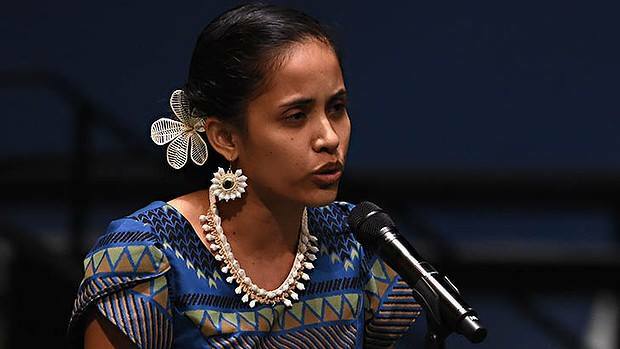 Kathy Jetnil-Kijiner, acclaimed poet and activist from the Marshall Islands, reflects on her time at this year’s Festival of the Pacific Arts in Guam and what it means for the people of the Pacific to safeguard that which is most important. Through the postings from Culture-Talk, a newsletter on Pacific cultural affairs, I came across this story from one of Pacific Islands’ great storytellers and poet, Kathy Jetnil-Kijiner. I personally did not attend this year’s Festival of Pacific Arts , but I have in the past participated in several events and share the same belief that it remains one of the most sacred festivals of the Pacific islanders and must be protected at all cost. Some readers here may remember Kathy’s poem on climate change I posted here in September 2014.“Dear Matafele Peinem”, a poem Kathy wrote for her seven month old baby moved world leaders during the UN Climate Summit in New York. Kathy Jetnil-Kijiner, acclaimed poet and activist from the Marshall Islands: “This past May I was one of thousands of islanders who flew into Guåhan for the annual Festival of Pacific Arts, alongside the delegation from the Marshall Islands, which rolled more than a hundred deep with Chiefs, weavers, dancers, dignitaries, Tobolar coconut businessmen, canoe builders, and tourism representatives (amongst others). If you want to see more cultural performances, videos on the 12th Pacific Festival of Arts are on You Tube.